The 8th generation is upon us. 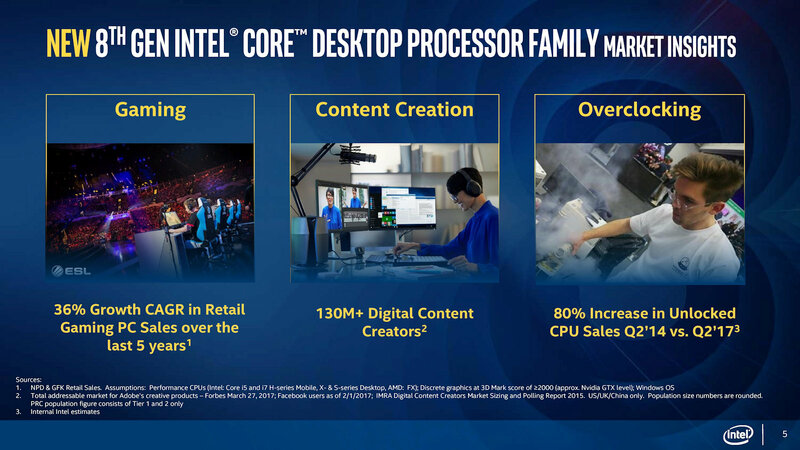 As a cap on the months of rumors, speculation and awful coffee puns, Intel officially announced its 8th generation Core desktop processors this morning. The first wave of Coffee Lake CPUs will arrive on October 5th. 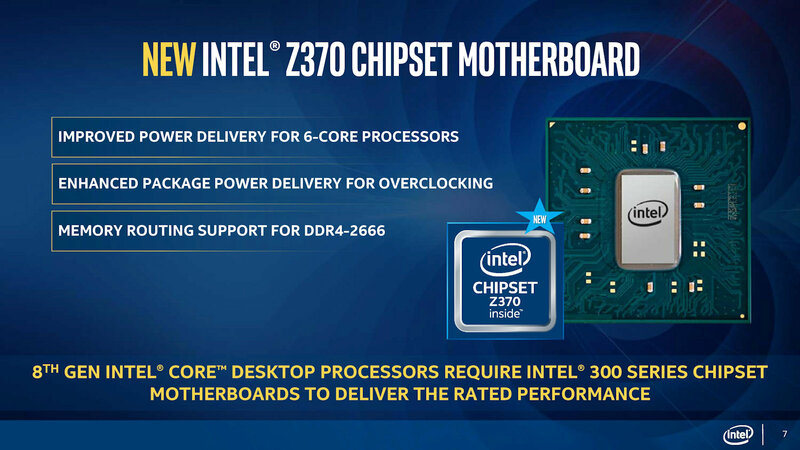 The 6 new CPUs will be arriving with Intel’s newest motherboard chipset, dubbed Z370. These new Z370 motherboards will be required to use the new Core desktop CPUs, as Intel explained that the additional power requirements and other advancements render existing Z170 and Z270 motherboards unfit for 6-core duty. The Coffee Lake launch will bring 2 CPUs each for the Core i3, Core i5, and Core i7 lines. Unlike previous generations ofthese product lines, Coffee Lake will deliver more cores across the board. While the Core i3 line has always featured dual-core CPUs, the 8th generation sees the debut of the new 4-core parts, the Core i3-8100 and Core i3-8350K. Traditionally a 4-core, 4-thread series, the Core i5 line is seeing a bump that brings all products up to 6 cores and 6 threads with the new Core i5-8400 and Core i5-8600K. Finally, the Core i7 series gets a bump from its 4 core, 8 thread roots with the all new Core i7-8700 and Core i7-8700K. 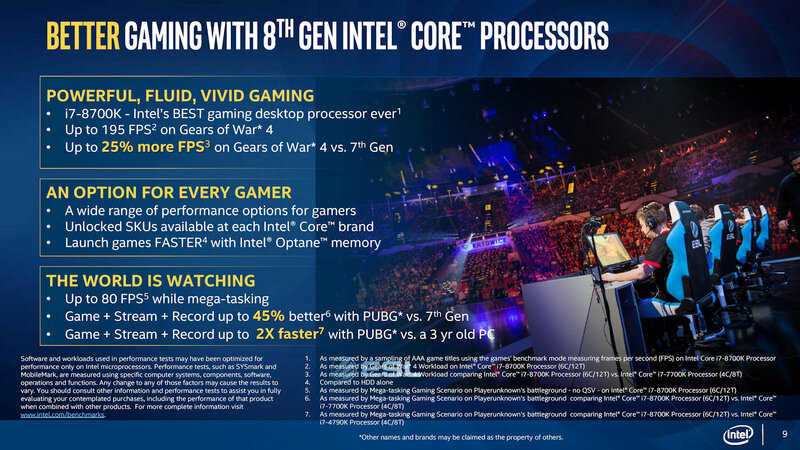 The new i7 parts sport 6 physical cores with hyper-threading for a total of 12 threads. Like always, the K-designated parts will ship with higher stock clock speeds than their cheaper counterparts and also come with unlocked multipliers, allowing for easy overclocking. Coffee Lake also brings along official support for DDR4-2666 memory speeds, a nice bump up from the DDR4-2400 and DDR4-2133 speeds that were supported by the Z270 and Z170 chipsets, respectively. All Z-class motherboards support memory overclocking and will automatically configure overclocked memory using Intel’s XMP 2.0 profiles. 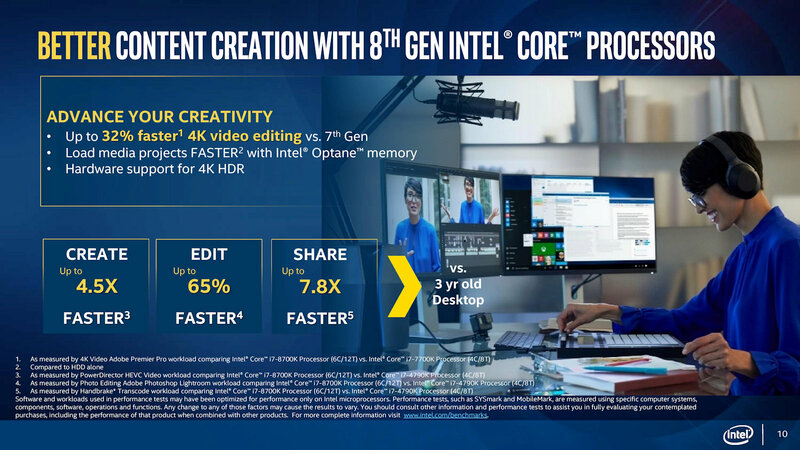 Intel is promising big gains for end users in multimedia content creation with Coffee Lake, promising up to 65 percent gains in video editing speeds when compared against Skylake. Improvements in game performance are promised to be up to 25% versus Kaby Lake, with Intel specifically mentioning Gears of War 4 as a prime beneficiary. PC gamers itching to upgrade should also know that intel has plans to release a follow up motherboard chipset, Z390, early in 2018. It is expected to bring more features to the platform that did not make the cut off for Coffee Lake. It is believed that 8-core CPUs may be arriving with the new design, but no word is available on compatibility with Z370 boards. Review embargos for the 8th generation Coffee Lake motherboards and CPUs are expected to lift on the morning of October 5th. that's good to know about the motherboard update being released so soon after the processors drop. Depending on what they offer it might be worth waiting.